This gallery is devoted to the memory of Bob Shores and the engines he designed. Bob has produced a number of excellent plans and casting sets over the years. He had thousands of people building his engines. He would take time to take phone calls, answer letters, or e-mail about any of his engines or any other model engine. He was opinionated and understanding at the same time. We first corresponded about 5 years ago when I posted a note in SIC Magazine about using propane for engine fuel. I was told that I should be using gas with 10% WD-40 because it was the only good fuel. 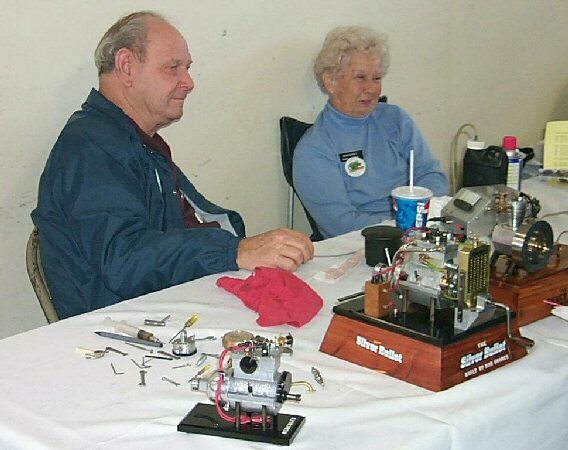 A few years later Bob wanted to start a model engine building club in Florida. The FAME web site came out of those talks as a way for engine builders every where to have a place to show there work and ask questions. The following are pages of pictures of Bob's engines taken at his home. Click on a engine type to view the pictures. This gallery is of engines built from The plans and castings from Bob Shores. Click on a pictures for more details. Copyright 2004-2008, Florida Association of Model Engineers, All rights reserved.